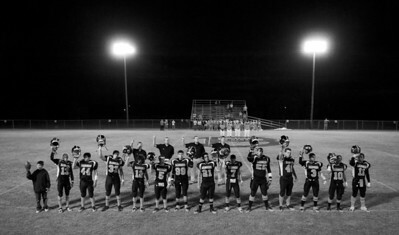 The Buckholts Badgers six-man football team stands in front of their crowd during the singing of the national anthem before their October 22, 2010 game vs. the Oglesby Tigers. Buckholts won 70-0 after the game was called at halftime due to the 45 point six-man football mercy rule. 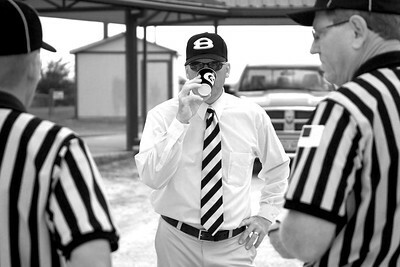 Cory Schwartz, Head Coach of the Buckholts Badgers six-man football team, talks with the referees before his team's homecoming game against the Evant Elks on September 25, 2010. Buckholts won 64-14 in a game ended in the fourth quarter because of the 45 point six-man football mercy rule. Jim Hauk Field is home to the Buckholts Badgers six-man football team. 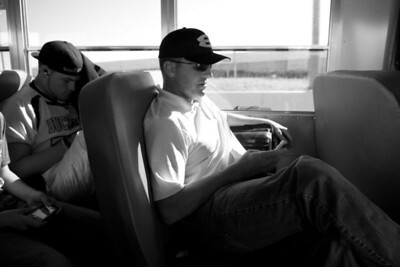 Head Coach Cory Schwartz looks at his phone during the two hour bus trip to play the Cranfills Gap Lions on October 8, 2010. The Buckholts Badgers six-man football team on their way to their final regular season game against division rival, Calvert, on November 5, 2010. 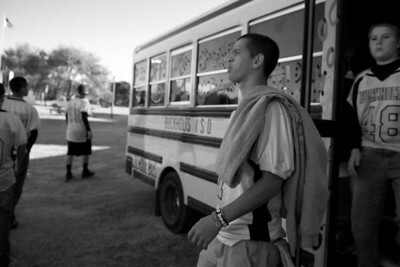 Quarterback William Watson spits as he walks off the bus before their final regular season game against division rival, Calvert, on November 5, 2010. Running Back Dustin Barker shows off his tatooes in the Buckholts locker room before an October 22, 2010 game with Oglesby. Buckholts won 70-0 after the game was called at halftime due to the 45 point six-man football mercy rule. William Watson, quarterback, linebacker, punter, and kicker for the Buckholts Badgers six-man football team, goes by the nickname "Willy Wonka" and has the tattoos to prove it. 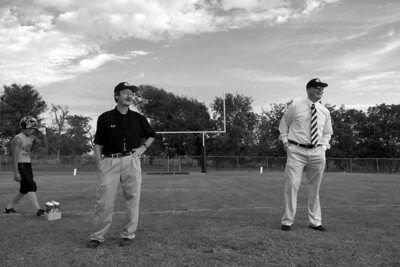 The team meets in the to review plays before their homecoming game vs. the Evant Elks on September 25, 2010. 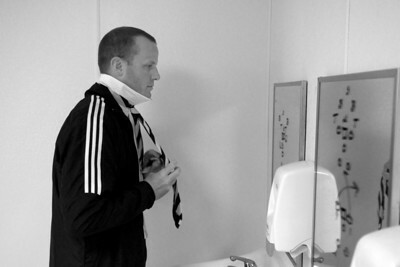 Head Coach Cory Schwartz gets ready for the final regular season game against division rival Calvert on November 5, 2010. 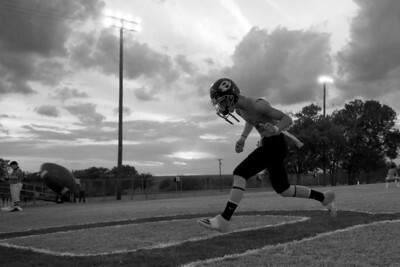 Running Back Dustin Barker gets focused in the locker room before their October 22, 2010 game vs. the Oglesby Tigers. 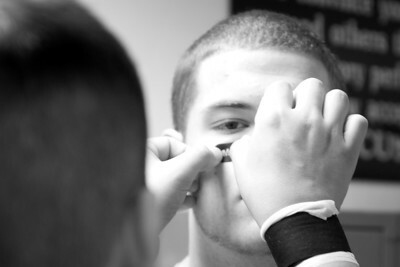 September 25, 2010 - Senior Center James Shelton gets help applying his eye black before the Buckholts Badgers Home Homecoming Game vs. the Evant Elks. 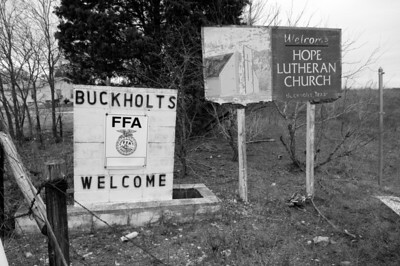 Buckholts won 64-14 in a game ended in the fourth quarter because of the six-man mercy rule. 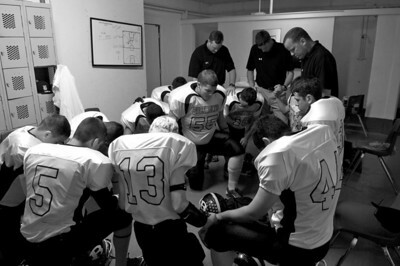 The the team prays in the locker room before their October 8, 2010 game vs. the Cranfills Gap Lions. Buckholts won 65-20 in a game ended in the fourth quarter because of the 45 point six-man football mercy rule. The Buckholts Badgers six-man football team walks out to the field together to run through warm-up drills before their September 25, 2010 game vs. the Evant Elks. James Shelton, Center for the Buckholts Badgers, gets the team ready to go out onto the field before their October 8, 2010 game vs. the Cranfills Gap Lions. Buckholts won 65-20 in a game ended in the fourth quarter because of the 45 point six-man football mercy rule. The Buckholts Badgers six-man football team runs through warm-up drills before their September 25, 2010 game vs. the Evant Elks. Buckholts won 64-14 in a game ended in the fourth quarter because of the six-man football mercy rule. 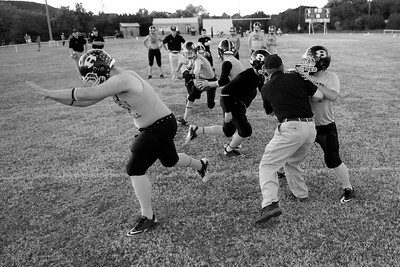 The Buckholts Badgers run through warm-up drills before their game vs the Cranfills Gap Lions on October 8, 2010. Buckholts won 65-20 in a game ended in the fourth quarter because of the six-man football mercy rule. William Watson, quarterback, linebacker, punter, and kicker for the Buckholts Badgers six-man football team practices kicking before their October 22, 2010 game vs. the Oglesby Tigers. The team runs through kicking drills before their final regular season game against division rival Calvert. 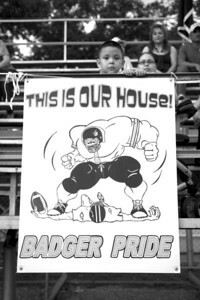 September 25, 2010 - Buckholts Badgers Homecoming Game vs. the Evant Elks. Buckholts won 64-14 in a game ended in the fourth quarter because of the six-man mercy rule. Dustin Barker (left) and William Watson (right) get focused in the locker room before the last game of the season on November 5, 2010 against Calvert, their division rival. 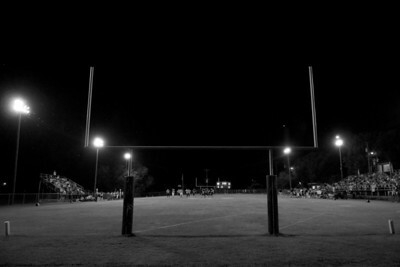 Calvert won 46-0. 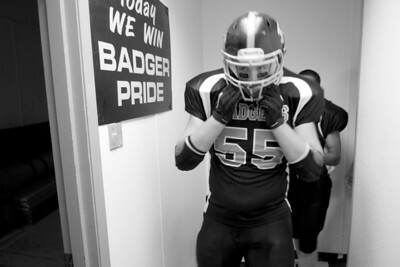 James Shelton, Center for the Buckholts Badgers, heads out of the locker room before their September 25, 2010 Homecoming Game vs. the Evant Elks. Buckholts won 64-14 in a game ended in the fourth quarter because of the 45 point six-man football mercy rule.